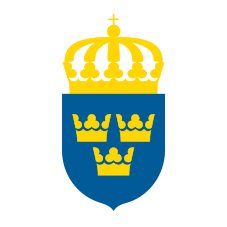 Sweden, officially the Kingdom of Sweden is a Scandinavian country in Northern Europe. It borders Norway to the west and north and Finland to the east, and is connected to Denmark in the southwest by a bridge-tunnel across the Öresund. At 450,295 square kilometres (173,860 sq mi), Sweden is the third-largest country in the European Union by area. Sweden has a total population of 10 million of which 2.3 million has a foreign background. It has a low population density of 22 inhabitants per square kilometre (57/sq mi); the highest concentration is in the southern half of the country. Approximately 85% of the population lives in urban areas, as per a unique Swedish definition where only 200 people constitute an urban system. In contrast, the OECD definition of the smallest urban system is 50.000 people. According to the OECD definition, only 41% of Swedes live in urban areas.